The first G.I. Joe movie The Rise of Cobra that came out in 2009 was a horrible sham. I'm glad to say that Retaliation doesn't share the same bad taste in the mouth. Instead, G.I. 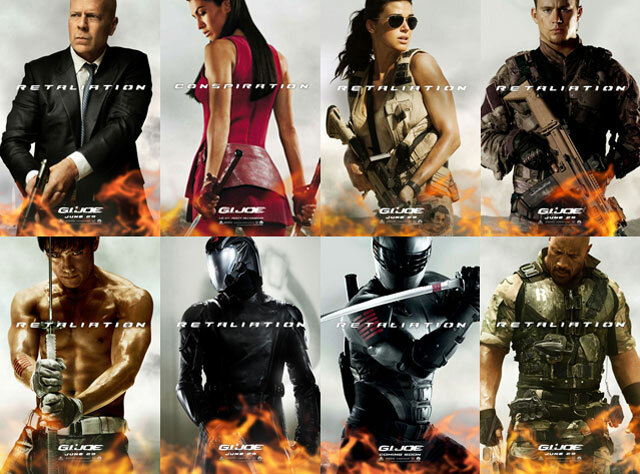 Joe is an entertaining non stop action film that properly utilizes the rich characters from the Hasbro property. There were a lot of rumors due to the nine month delay of this film. Rumors such as that the 3D needed to be improved and that Channing's character was killed off too early. Whatever the case, I would recommend this film. Retaliation continues where the last film left off and that is with the Cobra operative Zartan impersonating as the President of the United States. Noticeably gone are Ripcord played by Marlon Wayans and Scarlett played by Rachel Nichols among others. There's no explanation of their disappearance. With the only holdover from the prior film on the Joe's side is Duke played by Channing Tatum and Snake Eyes played by Ray Park. Instead we're introduced to Road Block played by Dwayne Johnson, Jinx played by Elodie Yung, Flint played by D.J. Cotrona, Lady Jaye played by Adrianne Palicki and the original "Joe" played by Bruce Willis. It's definitely a big jump in talent from the prior films with the star power of The Rock and Bruce Willis. All of the new characters all were quite interesting with the exception of Flint. The character just didn't seem too sure of himself throughout the movie which didn't seem very "Joe" like. In such cases you didn't really care if he was killed off or not. With the villains the biggest and best surprise was the introduction of Firefly. What an entrance he makes when arriving to free Cobra Commander from prison. He's played brilliantly by Ray Stevenson. As a long time G.I. Joe fan, I immediately recognize his costume when he strolls into the prison. Definitely one of my favorite scenes in the movie. My second favorite scene in the movie? When Snake Eyes and Storm Shadow battles it out with Snake Eyes using a machine gun and Storm Shadow the more traditional shurikens. Negative points for the movie? I'll go back to the rumors mentioned earlier. Yes, Channing's character died in the beginning. Which is such a shame considering the repertoire they built between his character and Dwayne's. Does the 3D jumps out of at you? I would have to say for the most part no. The visuals are good throughout the movie but it is worth it to pay 3D? Probably not. The positives far outweigh the negatives though, so go see it opening on March 29th. If you haven't seen the trailer, you can see it here.